The sea plays a central role in the Portuguese history, culture and way of life. It is a place where tradition and modernity go hand in hand in a meeting of generations surrounded by the same salty water. From fishing, to spear fishing, recreational diving, navigation, shipbuilding and wave sports, Portugal has its roots deeply sited in the Atlantic Ocean. Searching for the deeper meaning to this element some call home, in 2015 I started traveling along the Portuguese coast talking to men and women of the sea, humans who rely on it, that were born and raised “from within". This past summer the journey through the Portuguese Salt Water Culture took me to the Azores, specifically to the islands of São Jorge, Pico and Faial, sometimes referred to as the islands of the "Triangle". This first chapter focuses on the bits and pieces of the whaling heritage and the tales I collected from the people I met in the island of Pico. The Azores forms an archipelago composed of nine volcanic islands that grew from the bottom of the ocean through the addition of lava, ash and salt. To reach it, humans had to invest upon the unknown waters of the Atlantic, a quest that has been attributed to Diogo de Silves, the Portuguese navigator that first set foot on the island of Santa Maria in the year of 1427. For the last 500 years the volcanic archipelago’s culture has been sculpted from Portuguese traditions, sprinkled with its own proud regional identity. Island of Pico viewed from São Jorge. Nautical Club in Lages do Pico. Formerly used as a dock for whaling boats to depart from, it is now used as recreational area overlooking the mountain of Pico. In the second half of the nineteenth century the whaling Industry developed in the Azores. Whaling played a central role in the economy and culture of the Faial and Pico isles, where spearm-whales were hunted and worked in local factories to extract the valuable oil for use in machines and instruments, but also to make soaps, perfumes, makeup, flour, fats. From the bones local craftsmen would make instruments, tools and artwork. But the proliferation of mineral oils and synthetic products derived from ground-oil eventually replaced the animal oils and the economic activity around whaling declined. Still, whaling in the islands did not end until 1984, when it was prohibited by the International Wailing Commission under international treaties. The old whalers are disappearing. Their legacy can be seen in museums, festivities, traditional poetry and artwork around the island, in particular detail in the Pico Museum. The last survivors of this era can sometimes be found in costal towns, such as Ribeira or Calheta-do-Nesquim, sitting outside, close to ocean, playing cards and gossiping about life and its affairs. In such condition, dropping a close eye on the flow of cards, I found José Dinis and Fernando Cardoso, simple men, proud of the life they chose and holding tight to their whaling legacy. Mr. José Dinis wrinkled face and hoarse voice, worn by the salt and cigarets, tells stories that need not to be spelled. With 81 years of age, Mr Dinis was born and raised within a family of whalers, having set foot on his dad's boat for the first time at the age of three. "At home we were eight siblings" he says "...six boys and two girls, my mother and my father. At a certain point my dad, me and my five brothers formed a crew on a whaling boat.". José Dinis was born and raised within a family of whalers, having set foot on his dad's boat for the first time at the age of fourteen. "At home we were eight siblings, six boys and two girls, my mother and my father. At a certain point in our family my dad, me and my five brothers formed the crew on a whaling boat.". Here he stand in beside his boat "Sereia do Pico" (the Mermaid of Pico). Unlike many communities throughout the world that preserved a spiritual or traditional root to their whaling activities, Azoreans engaged in the practice and endured its hardships for purely economic reasons. "Life was hard", José Dinis says, "we would go out to put food on the table and to buy corn to feed our animals. But there was no special gear. The clothes we used in the fields were the same clothes we used at sea. We were wet and cold all the time and we used wet blankets to warmup and take shelter from the wind." Mr Fernando Cardoso, born in 1943, loved to whale and aspired to grow in the craft. "The sea was everything..." he says, while showing me his collection of harpoons and tools dating back to his whaling period, "...as young man I ditched an opportunity to work in the police and abandoned my job as a radio technician for the postoffice only to be in the sea. The sea was everything to me. The sea was fishing and the whale was my dream. To be great at that craft. The whaling, the whaling regatas, the tuna...everything for the sea....the sea is life...the sea is everything!".... "My life as a whaler was probably the most dangerous but also the most beautiful period of my existence." Whenever whales were spotted from watchpoints around the island of Pico, whalers would jump on their boats, approach the animals and get into position using sails or oars. Crews killed their quarry with hand-thrown harpoons and reeled in lines with their hands. After a kill the animals were brought to land under tough conditions. "If we had wind we could set sail. Without it we would have to row and after a kill tow three or four whales for over 30 miles to the factory to earn on average 2.500$00 escudos", José Dinis adds. The boats used by the whalers were built with lightwood and shaped with sharp profile to maximize speed. Six to eight rowers would sit along the sides of the boat that was steered by the leading officer, the "Mestre". On the bow rode the harpooner - the "trancador" - who had the task of throwing the harpoon and lock the whale for the kill. "Every young boy that chose that way of life had only one thing in his mind: to be at the bow or stern of the boat...to be an officer or to be a harpooner. I was lucky enough to become an officer." Fernando says. Fernando Cardoso. "The whale was my dream. To be great at that craft. The whaling, the whaling regatas, the tuna fishing...everything for the sea....the sea is life...the sea is everything!" Once a year the history and legacy of these men is brought to life through boats regattas, a competition between former whaling villages that row and sail agains each other in traditional wooden boats. In the village of Ribeira I found the carpenter and shipbuilder Mestre João Tavares, a man that opted out from a life at sea for his love for wood and ship building. Born and raised in the island of Pico, Mestre João Tavares grew close to ocean helping his grand-father catching bait to fish for conger. At the age of seven he went to school during the day and of to sea at night with local fisherman to fish for Atlantic horse mackerel, a fish that he would sell fresh in local markets and dry part of the catch to trade for corn during the winter. Being the son of a fisherman he was able to get his fishing permit at the age of fourteen. "I started my professional life at sea working in a yellow-fin tuna fishing fleet during the summer and working in the shipyard of Santo Amaro during the winter, making repairs and building boats from scratch..." he says "... but here in the Azores nobody would teach the art of drawing lines for ship building. So I when to Angola in 71 to work in a shipyard and learn how to do it...and I was good at it..."
Back in the Azores he became known for his craft and today Mestre João Tavares is one of the last man to hold the traditional knowledge behind the construction of whaling boats and his work can be seen locally and in museums throughout the world. But not without its costs he adds...."1971...was the last year I sat foot on a boat. I had to leave my fishing life behind. Boats kept me busy...but there was a time that the union wanted to take my licence because I wasn't fishing, but I didn't let them...How can a ship-builder shape a boat and test it in the water without a licence?...I still have it!" he says with a smile on his face. Mestre João Tavares standing in front of a tuna fishing boat in his workshop. 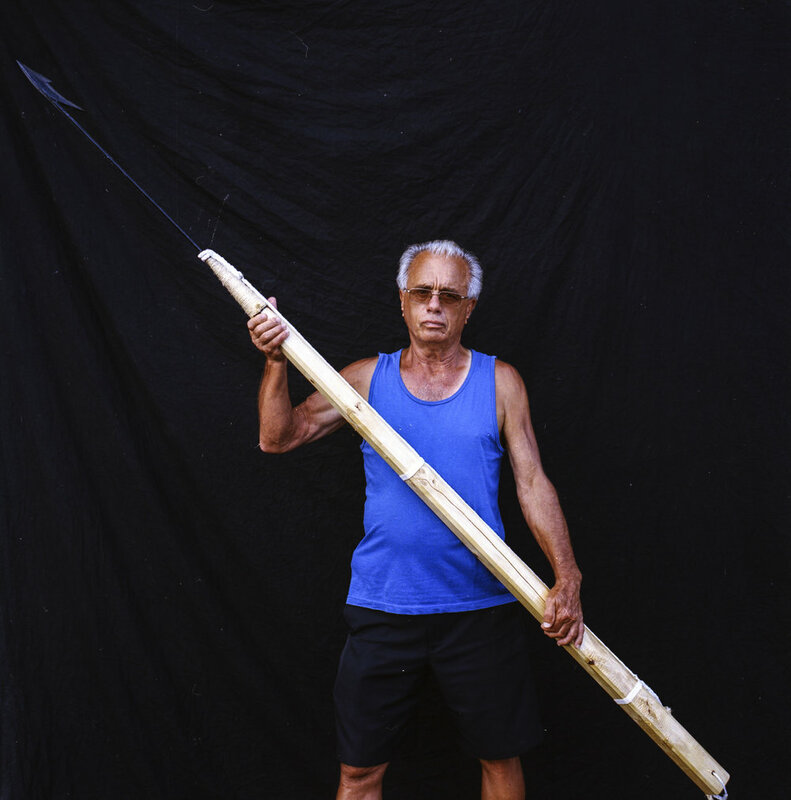 He is one of the last man to hold the traditional knowledge behind the construction and repair of whaling boats and his work can be seen locally and in museums throughout the world. "...there was a time that the union wanted to take my licence because I wasn't fishing, but I didn't let them...How can a ship-builder shape a boat and test it in the water without a licence?...I still have it!" Mestre João says with a smile on his face. Whaling-boat plans hanging on the wall of Mestre João's workshop. Whales went from hunted to protected species in a manner of years and as the whaling industry decayed fisherman were forced to turn their eyes to other sources of revenue such as yellow-fin tuna. Nonetheless, over the years that followed the implementation of international treaties, a new source of revenue was found, and today both Pico and Faial host a large number of whale-watching companies that patrol the coast in search of cetaceans for the delight of visiting tourists. Eduardo de Sousa, a former whaler from Lages do Pico, lived through the end of the hunting era to become a skipper in a whale-watching company. "I enjoy watching all animals of the sea. All of them without exception. But I especially enjoy watching humpback whales and I was lucky enough to save one from fishing nets a couple of weeks ago. The animal was tangled-up and if nothing was done it would die. So I jumped in the water with a knife and I cut the rope to set it free. It was a great joy. It is a joy for me to have killed these animals and now be part of their preservation." he shares. Along with the end of the industry other traditional crafts dared the process of extinction. Manuel Alves Gonçalves, former banker and native of the island of Pico, has been promoting the art of Scrimshaw, the carving of the jaw bone and teeth of the whale, for the last 26 years. "I'm not a man of the sea" he says, "I was a banker, a photographer, a designer and started this business just to make some extra money. Eventually I retired, about thirty years ago, and started investing all my time and money in the art of Scrimshaw, buying bones and teethes from whaler and collectors in the Azores, Madeira and mainland Portugal... a bit all over." Eventually, Mr. Manuel started to work on cow bone, vegetable ivory and wood, expanding his business to the demands of the market. "I enjoy working with every kind of raw material as long it is tough. I don't like to work with soft materials that can break or become easily scratched...but is has its challenges. The whale ivory is unforgiving. What you take away you can't put back". Eduardo de Sousa, a former whaler from Lages do Pico, lived through the end of the hunting era to become a skipper in a Whale-watching company. Manuel Alves Gonçalves, former banker and native of the island of Pico, has been promoting the lost art of Azorean Scrimshaw, the carving of the jaw bone and teeth of the whale, for the last 26 years. The whale hunting has ended, along with the industry, crafts and way of life that surrounded it. But there are still whales driving along the coast of the Azores, boats rushing to them, and an economic stir through tourism, museums, festivities and art shops in reference to these giant mammals. All happening under a revised concept aimed at the same purpose. To make a living from what the ocean provides. The Azores is a gem in the middle of the Atlantic. Very few places have I visited in which the ocean is so deeply entrenched in the culture, tradition and soul of its people. And it is easily understood. Its geography surely helps. But here, the ocean feels different...it tastes different...the people, the landscape, the sea...it wraps you like no other blanket of salt I have ever tasted before. 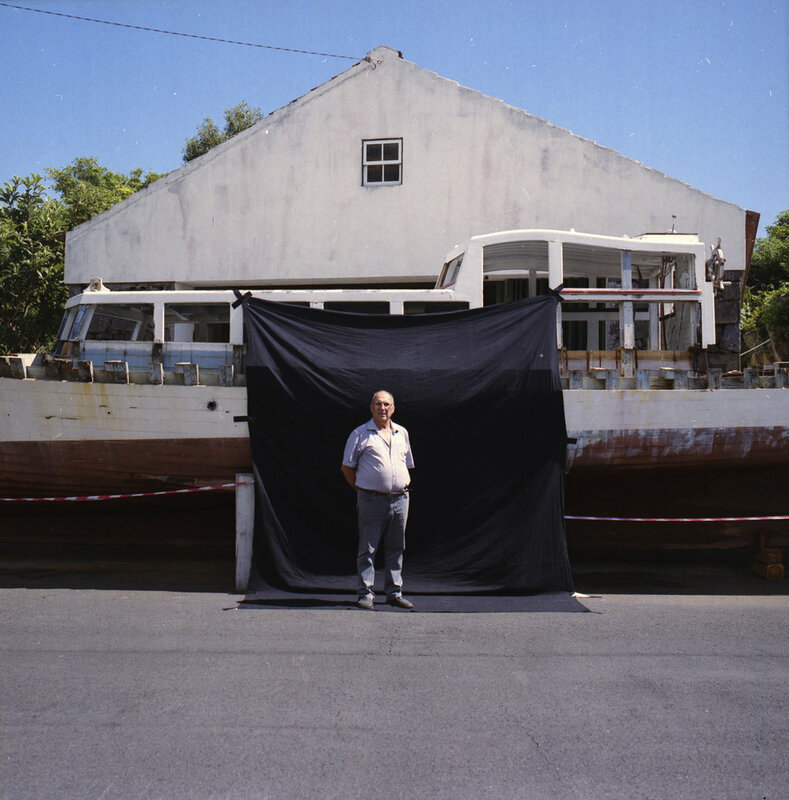 This project is shot on film using with an Hasselblad 500CM w/ 85mm f/2.